The sclera forms a tough fibrous outer coating for the eye. It is abnormally formed in severe congenital abnormalities of the eye including synophthalmia and microphthalmia. The sclera is thin and translucent in osteogenesis imperfecta, and there may be glycosaminoglycan deposition in the mucopolysaccharidoses. It may be stretched and thinned due to increased intraocular pressure (particularly in infancy) resulting in scleral thinning (buphthalmos or staphyloma). Inflammation of the sclera is relatively rare. Scleritis may affect the anterior region or occur posterior to the equator. The inflammatory process may be diffuse or nodular. There are many associated conditions most commonly rheumatoid arthritis. Degenerations occur in the sclera aging, in areas overlying melanomas. Abnormal depositions include calcium and amyloid. Tumours of the sclera are extremely rare and include episcleral osseous choristoma, haemangiomas or neurofibromas. 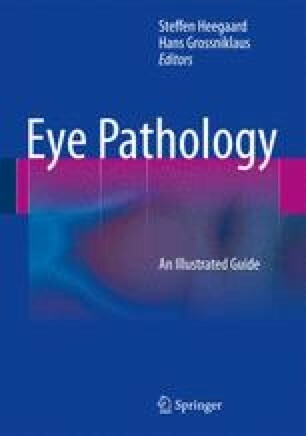 Secondary spread may occur from orbital tumours, metastases or uveal melanomas.